Zurich, 19 May 2014 – PET-Recycling Schweiz is fighting for every PET beverage bottle and would like to ensure that bottle disposal is as simple as possible, also when on the road. In this regard, the industry organisation can rely on the support of the Valora Group. What virtually nobody of the Swiss population knows yet: PET beverage bottles can also be returned at all k kiosk shops. The kiosk sales staff members then ensure that the collected bottles enter the recycling system once again. Because of this, a mutual information campaign is launched today. The thirst has been quenched, the bottle is empty. Where is the next PET BOX? 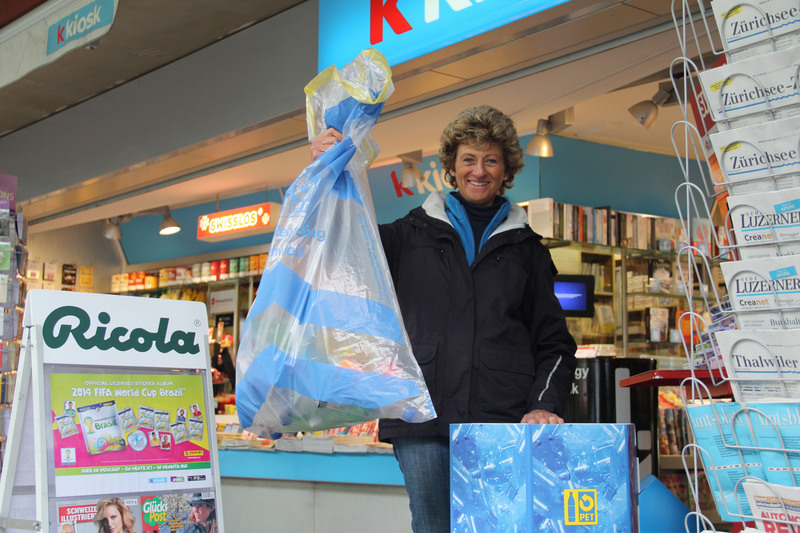 PET-Recycling Schweiz and the k kiosk shops of the Valora Group have an answer to this: The largest Swiss kiosk network would be happy to take back the empty PET beverage bottles. Thereby, with its collection points, PET-Recycling Schweiz is even closer to its consumers, also when they are on the road. And because every bottle counts, all k kiosk shops, even the smallest, are participating. By means of this the Valora Group further increases its commitment with regard to recycling – true to the motto: "Recycling of PET beverage bottles now also at k kiosk." In this regard, Marco Hocke, managing director of k kiosk: "For many people, the idea of being able to dispose of one's PET beverage bottle at every k kiosk, is rather unfamiliar. This is why we would like to use this campaign to explicitly encourage the population to do just this." Jean-Claude Würmli, deputy managing director of PET-Recycling Schweiz, is delighted with this new cooperation: "We are very happy that the Valora Group demonstrates such a strong commitment regarding PET-Recycling. By means of this, we can significantly increase the collection point density in the field of on-the-move consumption, in addition to further improving customer convenience. In total, more than 40,000 voluntary and obligatory PET-collection points are now available." members will be wearing a magnetic button with the corresponding information. And, also at the kiosk as such, additional information is being circulated. When purchasing a non-alcoholic beverage in a PET beverage bottle, the customers will have the opportunity of participating in a competition, with the possibility of winning attractive prizes (see box). In addition, throughout Switzerland, there will be posters pointing out "Recycling of PET beverage bottles now also at k kiosk". For Marco Hocke recycling is self-evident: "We set great store by responsible corporate governance, thus we endeavour to focus on environmental protection in all sectors. This also includes the recycling of waste paper, carton, plastic film and, naturally, PET beverage bottles. With our kiosk network, we can contribute to giving the Swiss citizens even more opportunities to dispose of their PET beverage bottles in a simple and convenient manner." When purchasing a beverage in a PET bottle at a k kiosk, all customers will receive a PET BOX CUP bottle lanyard. On the reverse, the winning field space simply has to be opened. There will either be an instant win in the form of a 1 franc discount for the next beverage (redeemable until 30 June 2014) or, with a 6-digit participation code, the chance of winning one of 20 iPads Air in the amount of CHF 549 each. More information on the competition can be found at www.petboxcup.ch. Good luck!